Basic, free account to meet your everyday checking needs. This free account offers no minimum balance requirements. Two reward programs! Reward yourself for everyday purchases with cash back offers and points towards merchandise and gift cards. Access over 118,000 surcharge-free ATMs nationwide. Find an ATM near you by searching in our mobile app or locations page. Protects you against fraud and ensures you won’t be held responsible for unauthorized use of your card. Bank from 6am to 11pm daily with extended hours teller service available at all branches. Open any MHV Checking Account with a debit card and use promo code: MYSPRING200 by June 30, 2019. Set up direct deposit of $500 or more within 60 days of account opening. Once you have met these conditions, we will deposit $200 into your account within 90 days. 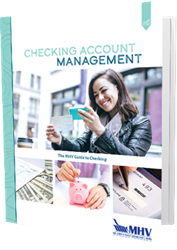 Download our free guide, "Checking Account Management", to discover what to consider when choosing an account and how to manage it successfully. Switching to MHV doesn't have to be difficult. Our Switch Kit can help you collect the information you need to make the transition quite simple. looking for other CHECKING ACCOUNTs? This $200 offer still applies! I love the no monthly fees and the friendly employees who recognize me and say hello. They are always professional. I love the fact that there is a live personal teller service when help is needed after hours! * To receive $200 bonus, member must qualify, open and maintain a new checking account with debit card, and direct deposit must be at least $500 or more made into MHV Checking Account within 60 days of account opening or bonus will be forfeited. One bonus per member with no additional or previous checking accounts within the past 2 years. Bonus will be deposited in primary share within 30 days of direct deposit and is subject to IRS reporting. Offer valid through June 30, 2019. Offer subject to terminate at any time. Cannot be combined with any other offer. Existing members must be in good standing.